Shri Mataji "On 28 February 1990 Shri Mataji Nirmala Devi, on Her way to Australia, stopped at Changi Airport, Singapore. She informed the Sahaja Yogis who had gathered to meet Her that"In Islam there was a complete surah written about Her. In this surah it was stated that the Sent One will give Realization, will make you Pirs and give Collective Consciousness. But you will be non-believers.” (Divine Cool Breeze Revelations 1989-90, Vishwa Nirmala Dharma, p. 141.) The surah She refers to is Al Qiyamah (The Resurrection)! And the Unbelievers (Al-Kafirun) will be the entire Muslim community who will collectively reject what is written in black and white in their own Qur'n!" Namaste - i bow to His self-reproaching Spirit (Ruh/Shakti/Holy Spirit) who resides in you! i found a most precious surah 47:18-24 that rams open the centuries- old guarded gates of Islam and lays bare the falsehood and satanic misguidance of the ulema (Muslim clergy) that the Ummah have always followed. 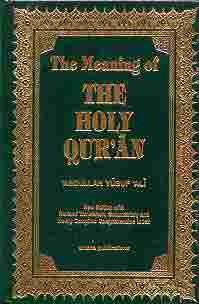 i use the term"satanic misguidance"to emphasize the scale and magnitude of the corruption, misinterpretation and ignorance of the heart and soul of the Quran—The Resurrection—foisted by tens of thousands of ulema (Muslim clergy) upon the unsuspecting Ummah (Muslim community) over the last 14 centuries! Such is the scale of falsehood that Muslims, who call non-Muslims kaffirs (non-believers), will themselves be non-believers. Without question they can be admonished and, as the Quran warns, will run away like "Affrighted asses, fleeing from a lion"I.e., flee in disbelief from the universal warning that Al-Qiyamah (The Resurrection) has commenced! "And this is no other than a warning to mankind. As if they were affrighted asses, fleeing from a lion! Scrolls (of revelation) spread out! Let any who will, keep it in remembrance! "On 28 February 1990 Shri Mataji Nirmala Devi, on Her way to Australia, stopped at Changi Airport, Singapore. She informed the Sahaja Yogis who had gathered to meet Her that"In Islam there was a complete surah written about Her. In this surah it was stated that the Sent One will give Realization, will make you Pirs and give Collective Consciousness. But you will be non-believers.” (Divine Cool Breeze Revelations 1989-90, Vishwa Nirmala Dharma, p. 141.) The surah She refers to is Al Qiyamah (The Resurrection)! And the Unbelievers (Al-Kafirun) will be the entire Muslim community who will collectively reject what is written in black and white in their own Qur'n!" Note: Shri Mataji Nirmala Devi was born on March 21, 1923 to a Christian family in Chindawara, India and then married into a Hindu family. Her father was a renowned scholar and master of 14 languages who translated the Qur'n in Marathi. Now She is explaining the living, breathing Qur'n to all the Believers of God Almighty. May the wise and visionary see far into the future to envision the matchless ingenuity of Allah's (SWT) Plan for humanity, one that will be harmoniously and willingly embraced by all irrespective of their religious background. 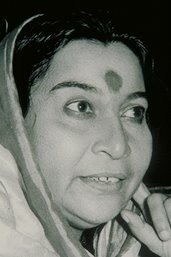 Shri Mataji “But the Muslims do not want to talk about Resurrection at all because they want to frighten people with the Doomsday. They don't want to talk about the Resurrection Time which is going to come, which is the intermediary time (Al Qadr: The Night of Power), because they want to use the time (Al Qariah: Day of Noise and Clamor) which will frighten people by saying that: 'Now your Doomsday is coming! Now your Doomsday is coming!'" Only now in this modern age of universal education, mass media and publishing technology—after 14 centuries and unlike the illiterate past—is it possible to own and be sufficiently literate to "study the Quran carefully" in languages they understand best. * And just in case the Believers start studying the entire Qur'n, it must be stressed that Allah (SWT) is referring specifically to those eschatological Signs and surahs upholding His Call to bear witness of the Resurrection! They must thoroughly examine and understand the Signs that have already manifested, and set forth by messengers from amongst themselves.